Rediff.com » Movies » Are tickets for Rahman's world tour too steep? Are tickets for Rahman's world tour too steep? The A R Rahman multi city tour across North America was postponed half way through its schedule following the collapse of a part of the Pontiac Silverdome in Detoriot damaging the stunningly conceived sets and lights. Rahman who has vowed to revive the concert categorically denied the cancellation in other cities had to do with the alleged poor sales of tickets. 'Nobody expected the bottom to drop out on A R Rahman's world tour,' a LA Times blogger wrote. 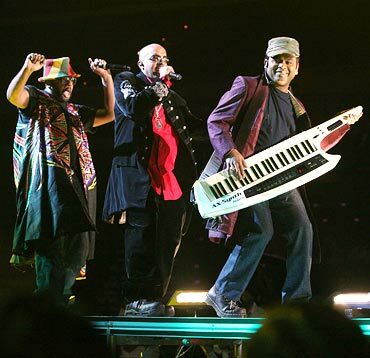 The June 19 cancellation lead to, as Rahman said, an agonizing decision, He first thought of postponing dates in Detroit and Toronto but on June 22, he decided to cancel the remaining North American tour stops in Los Angeles, San Francisco, Vancouver and Houston till the sets were rebuilt. Since the show in Europe would take off in July, there was time to rebuild the sets. "All the artists, singers, musicians, dancers, technicians (myself included) have been almost given a second life," Rahman said on his Website. Earlier in an interview he had said that the show's strength was not only in its musical numbers but also in its beautiful choreography and circus acts. But some of the promoters who had reportedly paid anything between $500, 000 to $1 million for each show were upset even before the Detroit event that tickets were not moving fast enough. Some were heard saying even as the first show was ending in New York that they wanted to renegotiate the price they had paid but the world promoters of the tour were not willing to do so. Rahman has not been kept well informed by the organisers in India about the problems they were facing, one of the promoters from the Midwest was heard telling his colleagues in New York. Even as Rahman has announced on his site that the tour will continue in the UK and a few other European cities as per the schedule, he responded to the allegations of the poor ticket sales. 'It is normal that Asians buy it in the last three days of the show ...The proof was the four shows we did which were 95 percent full," he emailed to Rediff India Abroad..
One of the international promoters of the show, Deepak Gattani, and several promoters in the cities such as Los Angeles and Toronto, were not available for comment. The briskly-paced and visually stunning show which had a solid mix of old and new melodies was surely a benchmark for Indian entertainment in North America. But showbiz insiders, who asked for anonymity, said each show had about 25 percent of the seats (say out of 90,000 in Atlantic City) free tickets given to the local sponsors and big advertising firms. They also said tickets costing $150 and beyond did not have many buyers. "Some of the tickets were of course crazily priced at this recession period," Rahman added. "I am thankful to God and all the people who bought tickets and made this tour start like a rocket ... when big international pop stars had to cancel their tour due to empty halls." The Jai Ho Concert: The Journey Home World Tour had expected 7,000 people in Detroit, according to Chris Kelly, who was co-promoting the show in Detroit who also told the media that several workers received minor injuries and the Pontiac Fire Department was called to the scene to assist in the clean-up and begin an investigation of what went wrong. On his Website, Rahman asserted the tour will be rescheduled but that could happen in August or September and the question remains if the artists who had committed two months for the show will have more time to give. Some people who have produced musical events also pointed out with the Shankar Eshan Loy show scheduled for next month, and on a smaller scale, Alka Yagnik and Kumar Sanu show also scheduled for July, if they will be able to sell sufficient number of tickets to break even. "Unless the price of the show are drastically reduced selling more than half of the tickets at $75, and adding a few more glamorous singers to the show, it could be a big challenge to make the show fly," said one promoter who is not associated with the show. Many people had complained that the show had only two or three big time names such as Hariharan, Benny Dayal and Javed Ali. "It need a big name female singer." A few showbiz insiders said while the international and national promoters of the show won't lose any money due to the cancellation/postponement because of the insurance, some of the promoters are thinking of asking their money back. Rahman added on his Website: 'While I apologise for any inconvenience this may have caused our friends in the US and Canada, maybe it's a blessing in disguise, as we will have the opportunity to perform for you with even more energy and perfection." Image: A R Rahman and his troupe peform in Atlantic City. Is Jai Ho! A R Rahman's best song? Taking on the world, Rahman-style!